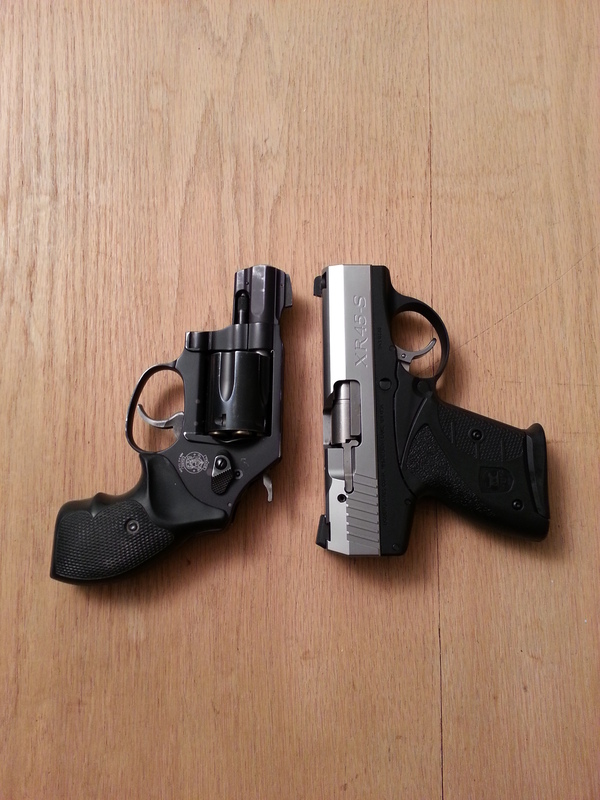 Reprise: the *other* perfect concealed carry revolver(s). Prompted by my friends over at the Liberal Gun Club, this is another in an occasional series of revisiting some of my old articles which had been published elsewhere over the years, perhaps lightly edited or updated with my current thoughts on the topic discussed. This is an article I wrote for Guns.com, and it originally ran 11/26/2011. Some additional observations at the end. The Smith & Wesson models 442 and 642 revolvers have their roots back more than 60 years ago. Needless to say there have been any number of variations on the J-frame theme over time (there are currently 49 versions offered on the S&W website), but perhaps the most popular has been the Airweight 642 (in stainless steel or brushed aluminum, and a variety of grips). The 642 certainly has been a very good seller, and has been at or near the top of S&W’s sales for most of the last decade. The 442 and 642 models are identical in every way except finish (the 442 is blued), but the 642 is more popular. Why is this gun so popular? Well, it does everything right, at least as far as being a self-defense tool. It’s small, lightweight, hides well in a pocket or purse, is intuitively easy to shoot, and it handles the dependably potent .38 Special cartridge. But let me expand on those points. The first three are all tied together. For anyone who is looking for a gun to carry concealed, the J-frame size has a lot going for it. The 642’s barrel is one- and 7/8-inches. Overall length is just a bit more than six inches. Though the cylinder is wider than most semi-autos, the overall organic shape of the gun seems to make it hide better in a pocket or behind clothing. The Airweight 642 weighs just 15 ounces unloaded, and not a lot more loaded. For most people, this is lightweight enough to carry in a pocket or purse without really noticing it. Put it in a belt holster and you’ll not even know it is there. Easy to shoot? Well, yeah, though it takes a lot of work to be really accurate with one at more than close self-defense distances. The 642 is Double Action Only (DAO), which means that the hammer is cocked and then fired all with one pull of the trigger – nothing else needs to be done. There’s no safety to fumble with. Just point and click. Almost anyone can be taught to use it with adequate accuracy at self-defense distances (say seven yards) in a single trip to the range. The modern .38 Special +P cartridge is more than adequate for “social work”. 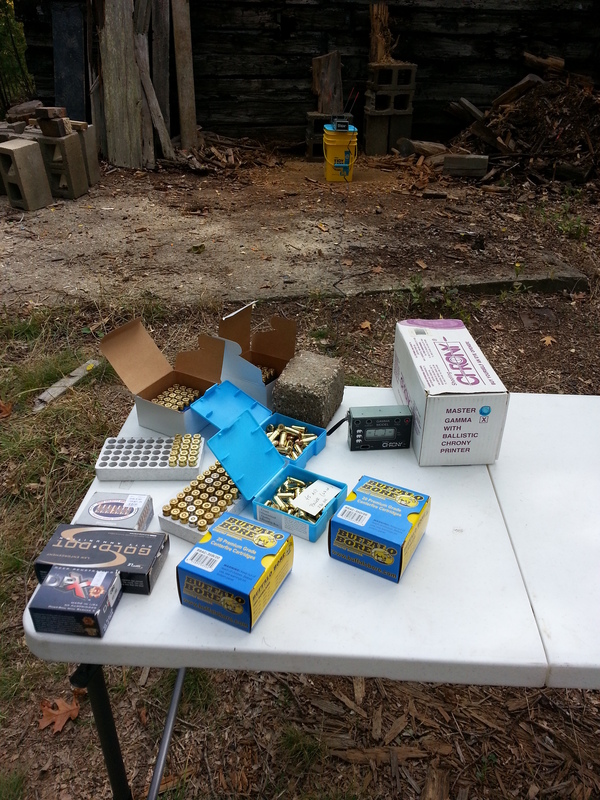 From my 642 we tested five different premium defensive loads and four of the five were between 900 and 1000 fps. Tests from Brassfetcher have shown that these cartridges both penetrate and expand well, too. One more thing – the design of the Centennial models, with the internal hammer, means that they are snag-free. You don’t have to worry about some part of the gun catching on clothing or other items when drawing it from concealment. This can save your life. With all the good being said, I do have two criticisms. The first one is minor, and easily fixed: the trigger. Oh, it’s good, but it could be a little bit smoother right out of the box (like Ruger’s LCR). The good news is that this can usually be worked out with just some dry-firing exercises. The second is the front site. S&W is still offering the guns with just a simple ramp sight. They should switch over to some variety of tritium sight or fiber-optic (or combination), as they have done with many of their other J-frame models. This is one change which would help in low-light conditions. So, there ya go. 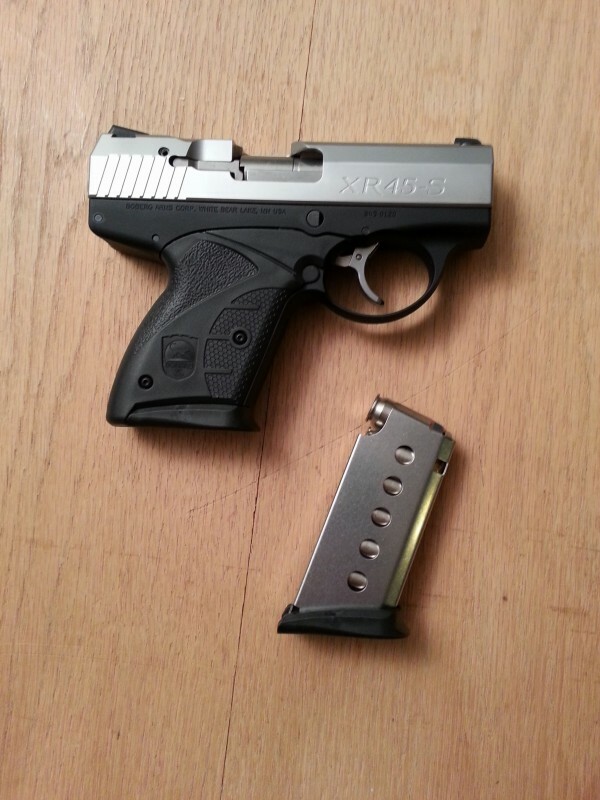 Want the nearly perfect pocket pistol? You’d be hard pressed to do better than a 642 or 442. There’s not a lot I would change in the seven years since I first wrote this, which in itself says a hell of a lot about the popularity of the 442/642 models. They’re still ubiquitous, high quality, and effective self-defense guns. After that was written we did another large BBTI test which included the .38 Special cartridge, which confirmed what I already knew: that while there are indeed some better and some worse performing brands of ammo available for the snubbie, for the most part all decent ‘self-defense’ ammo performs adequately. While my friend Grant Cunningham recommends the Speer 135gr JHP Short-barrel ammo (which I used to carry and still like), I now prefer Buffalo Bore’s 158gr LSWCHP +P for my M&P 360 — I’ve repeatedly tested that ammo at 1050fps out of my gun, which gives me a muzzle energy of 386 ft-lbs. But it’s not for the recoil-shy, particularly out of a 11.4oz gun. As always, YMMV. While S&W hasn’t changed the sight offerings on the 442/642, there are lasers available for the guns, which some people like. Personally, at the range which these guns are likely to be used, I don’t see the benefit. But if you like a laser, go for it. Bottom line, the 442/642, like the Ruger LCR, are nearly perfect revolvers for concealed carry in either a pocket or a belt holster. Reprise + New Review: Uberti Lightning and Taurus Thunderbolt pump carbines. Prompted by my friends over at the Liberal Gun Club, this is another in an occasional series of revisiting some of my old articles which had been published elsewhere over the years, lightly edited or updated with my current thoughts on the topic discussed. This is an article I wrote for Guns.com, and it originally ran 2/27/2012. In addition, I am including a new but related review of the Taurus Thunderbolt following the original review. 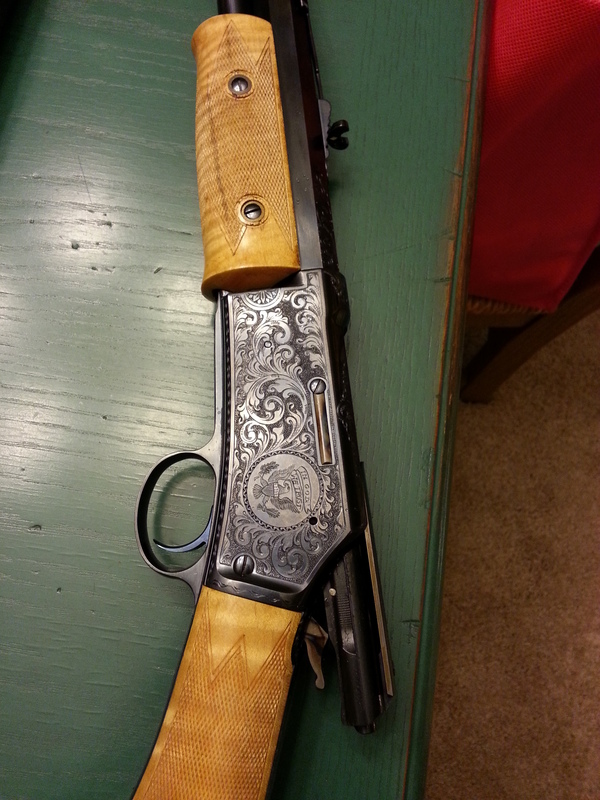 I have owned several lever guns over the years—a style I deeply enjoy. Currently, I have a Winchester 94AE in .44 magnum, which I love. However, I always keep my eyes open for a lever gun in .357 mag. It’s a cartridge that really begins to shine when paired with a carbine length barrel. Based on BBTI testing, it gains upwards of 50 percent velocity and pushes 1,200 foot/pounds of muzzle energy. But then the Uberti Lightning came into my life—a .357 pump carbine—and I wasn’t quite sure how to feel. It’s a reproduction of the original Colt Lightning, originally manufactured in 1884 (but, curiously, listed as the Model 1875 by Uberti), and a pretty faithful reproduction at that. The only changes it has are to meet modern safety demands. Specifically, there’s a new hammer safety (of the transfer-bar variety), which eliminates the option to fire the gun just by pumping new rounds while keeping the trigger pulled. This also greatly reduces the chance of an accidental discharge. The Uberti Lightning I shot was the ‘short rifle’ version, meaning it has a 20-inch barrel, with a case-hardened frame and trigger guard. It’s a very attractive gun with a top-notch fit and finish, a beautiful walnut stock—smooth in back and checkered on the slide—and good detail work. 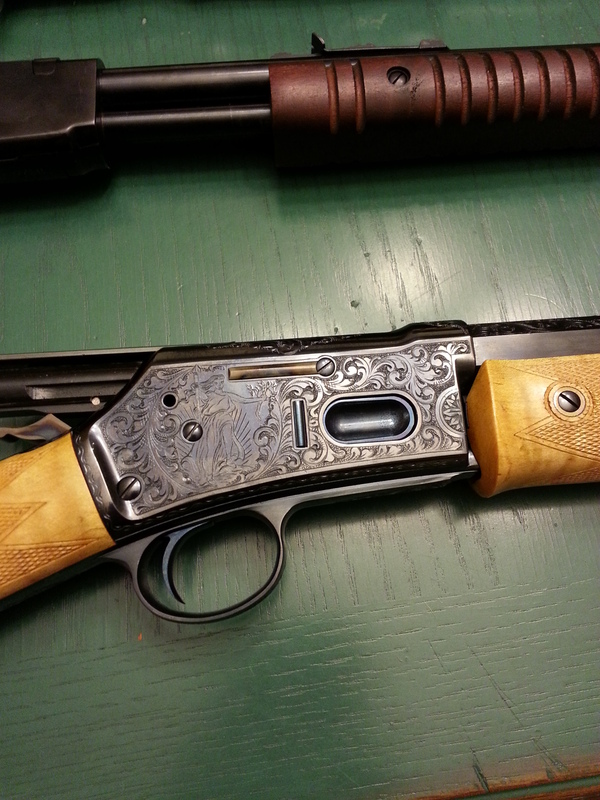 The case-hardening is quite attractive, but the gun is available in just a blued version if you prefer. When first loading the gun I experienced a common problem that Uberti cautions about (and something I was warned about by several other reviewers): it is relatively easy to get a cartridge wedged under the carrier that loads a round from the tubular magazine into the chamber. This can also happen when you cycle the gun, if you’re not careful to push the slide grip fully forward and fully back. I wasn’t the only one of the three of us trying the gun who had this problem, and each time we had to stop, dislodge the cartridge with a small screwdriver, then cycle the action fully. It’s a flaw in the design, there’s little doubt about that. However, once we all got the hang of it, we had no problems firing the gun quickly and accurately. And I think that is the nicest thing about the Lightning: once you learn how to use it, it is faster and easier to stay on target than using a lever gun, at least for me. And I have a fair amount of experience shooting lever guns. You can run through 10 rounds almost as fast as you can pull the trigger. The gun shot well, and was very accurate. At 25 yards (the longest distance we had available) it was no challenge to keep rounds in the X. Others have reported that it is just as accurate out to 50 yards, and I have no difficulty believing that. Recoil is minimal, even with ‘full house’ 158 grain loads. The gun does have a curved metal buttplate, so the recoil-sensitive shooter could easily add something there to cushion recoil if necessary. The gun is built robustly enough that it should handle just about any .357 magnum load out there without excess wear, and of course you can shoot .38 specials if you’re looking at reduced power needs or want to save a little coin at the range. The Uberti website no longer lists the Lightning as available for sale, so if you’re interested in one of these guns you’ll need to hunt for it on your favorite firearms auction/sale site. The MSRP was $1259 last I saw. So, if like me you’ve been thinking that you need to get a .357 lever gun, broaden your horizons a bit and consider the Uberti Lightning pump, instead. I am. And about a year ago, I found one. Well, kinda. That’s a 26″ barrel, and the tube mag holds 14 rounds of .357 mag (I think it’ll hold 15 of .38 special, but I would have to double-check that). Stainless steel, with walnut stock and fore-grip. The MSRP was $705, and I got mine (new, unfired, but it had been a display model for Taurus, so it had been factory reconditioned) for about 2/3 that price. You can still find them on various auction/sales sites for about $600 and up. The Taurus isn’t as nice as the Uberti was, in terms of the finish. Still, it’s quite nice enough, and the mechanical aspects all seem to be fine. Particularly after breaking it in (say 3-400 rounds), there’s much less tendency for the design flaw mentioned above to trip you up, and most of the people who have shot mine have gotten the hang of it quite quickly. It really is a slick-shooting gun, and once you’re used to it you can fire the thing almost as fast as a semi-auto carbine. It’s also easy to keep the gun shouldered and on-target, which I find difficult to do with a lever-action gun. I’ve found the gun to be quite accurate, easily as good as the Uberti version. Being able to ‘top off’ the tube mag is nice, and there’s no need to fuss with magazines — though reloading it is definitely slower, and an acquired skill. Also, you have to carry loose rounds in a pouch or pocket. My Thunderbolt weighs more than the Lightning (8+ pounds compared to less than 6 for the Lightning), due to the 6″ longer barrel/magazine. That makes recoil even more manageable, and I haven’t had anyone complain about shooting it even with hot .357 magnum loads. With mild .38 special loads it’s like shooting a .22, and a lot of fun for plinking. I’m really happy I found this gun, and again I find myself saying what I did in my original review six years ago: if you’re in the market for a lever-gun in .357 mag, consider opting for a pump version, instead. And definitely, if you get a chance to shoot either of these guns, take it. You’ll be glad you did. Prompted by my friends over at the Liberal Gun Club, this is another in an occasional series of revisiting some of my old articles which had been published elsewhere over the years, perhaps lightly edited or updated with my current thoughts on the topic discussed. This is an article I wrote for Guns.com, and it originally ran 1/12/2012. Some additional observations at the end. Who in their right mind would pay $1,200 . . . $1,500 . . . $2,000 . . . or more for a used production revolver? Lots of people – if it is a Colt Python. There’s a reason for this. The Colt Python may have been a production revolver, but it was arguably the finest revolver ever made, and had more than a little hand-fitting and tender loving care from craftsmen at the height of their skill in the Colt Custom Shop. But the Python has generally been considered exceptional by shooters, collectors, and writers for at least a generation. Introduced in 1955, it was intended from the start to be a premium revolver – the top of the line for Colt. Initially designed to be a .38 Special target revolver, Colt decided instead to chamber it for the .357 Magnum cartridge, and history was made. What is exceptional about the Python? A number of different factors. First is the look of the gun. Offered originally in what Colt called Royal Blue and nickel plating (later replaced by a polished stainless steel), the finish was incredible. The bluing was very deep and rich, and still holds a luster on guns 40 to 50 years old. The nickel plating was brilliant and durable, much more so than most guns of that era. The vent rib on top of the barrel, as well as the full-lug under, gave the Python a distinctive look (as well as contributing to the stability of shooting the gun). It had excellent target sights, pinned in front (but adjustable) and fully adjustable in the rear. The accuracy of the Python was due to a number of factors. 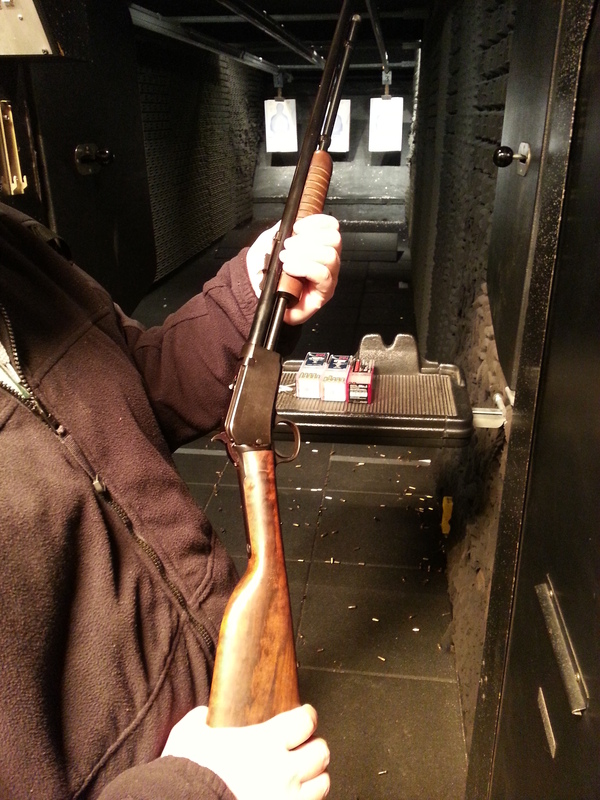 The barrel was bored with a very slight taper towards the muzzle, which helped add to accuracy. The way the cylinder locks up on a (properly functioning) Python meant that there was no ‘play’ in the relationship between the chamber and the barrel. The additional weight of the Python (it was built on a .41 Magnum frame for strength) helped tame recoil. And the trigger was phenomenally smooth in either double or single action. Seriously, the trigger is like butter, with no staging or roughness whatsoever – it is so good that this is frequently the thing that people remember most about shooting a Python. The Python had minimal changes through the entire production run (it was discontinued effectively in 1999, though some custom guns were sold into this century). It was primarily offered in four barrel lengths: 2.5-, 4-, 6-, and 8-inch, though there were some special productions runs with a three-inch barrel. Likewise, it was primarily chambered in .357 Magnum, though there were some special runs made in .38 Special and .22 Long Rifle. The original grips were checkered walnut. Later models had Pachmayr rubber grips. Custom grips are widely available, and very common on used Pythons (such as the cocobolo grips seen on mine). The Python was not universally praised. The flip side of the cylinder lock-up mechanism was that it would wear and get slightly out-of-time (where the chamber alignment was no longer perfect), necessitating gunsmith work. Mine needs this treatment, and I need to ship it off to Colt to have the work done. And the high level of hand-finishing meant that the Python was always expensive, and the reason why Colt eventually discontinued the line. If you have never had a chance to handle or shoot a Python, and the opportunity ever presents itself, jump on it. Seriously. There are very few guns that I think measure up to the Python, and here I include even most of the mostly- or fully-custom guns I have had the pleasure of shooting. It really is a gun from a different era, a manifestation of what is possible when craftsmanship and quality are given highest priority. After you’ve had a chance to try one of these guns, I think you’ll begin to understand why they have held their value to a seemingly irrational degree. On average, for online gun sellers, the Colt Python sells for more than $2,000, but there are occasions where you’ll find it for less than a grand. The value of the Pythons has continued to rise in the almost six years since I wrote that, and I’m just glad I got it before the market went nuts. I haven’t seen one sell for less than a thousand bucks in years. I did send my Python off to Colt to have it re-timed before the last of the smiths who had originally worked on the guns retired, and it came back in wonderful condition. I don’t know what all they did to it, but it cost me a ridiculously modest amount of money — like under $100. It was clear that there was still a lot of pride in that product. Whenever I get together with a group of people to do some shooting, I usually take the Python along and encourage people to give it a try. More than a few folks have told me that it was one of their “Firearms bucket list” items, and I have been happy to give them a chance to check it off. Because, really, everyone who appreciates firearms should have a chance to shoot one of these guns at some point in their lives — it’d be a shame to just leave such a gun in the safe. An absurd comparison. Or is it? We had another of those wonderful & rare mid-50s January days here today, so I decided to get out for a little range time. In addition to the other shooting I did (basically, practice with some of my preferred CCW guns), I also did a little head-to-head comparison between a Smith & Wesson M&P 360 J-frame in .38 Special and a Colt Anaconda in .44 Magnum. Wait … what? Why on Earth would anyone even consider trying to do such an absurd comparison? 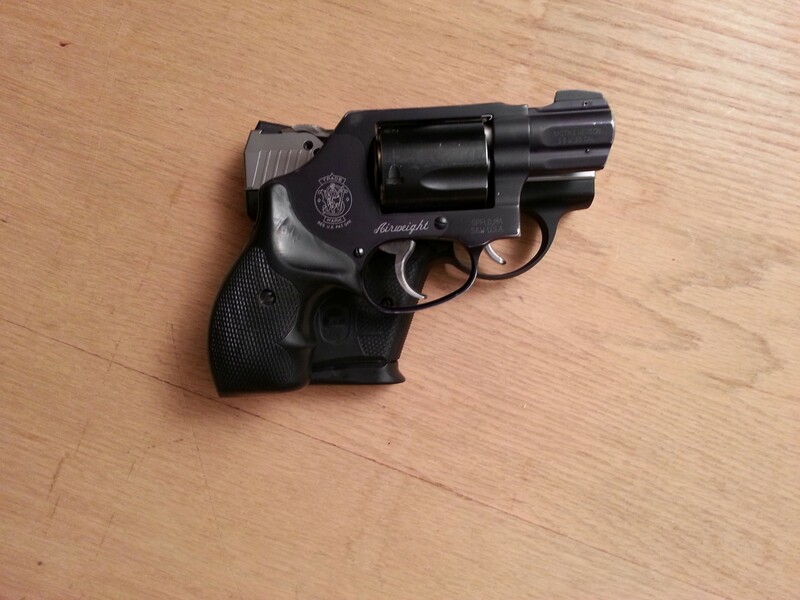 The S&W is a very small gun, and weighs just 13.3 ounces. The Anaconda is a monster, weighing in at 53 ounces (with the 6″ barrel that mine has), and is literally twice as long and high as the J-frame. The .38 Special is generally considered a sufficient but low-power cartridge for self defense, while the .44 Magnum still holds a place in the popular mind as ‘the most powerful handgun in the world‘ (even though it isn’t). Well, I was curious about the perceived recoil between the two, shooting my preferred loads for each. The topic had come up in chatting with a friend recently, and I thought I would do a little informal test, just to see what I thought. So for the M&P 360 I shot the Buffalo Bore .38 special +P, 158 gr. LSWHC-GC which I have chrono’d out of this gun at 1050 fps, with a ME of 386 ft-lbs. My conclusion? That the M&P 360 was worse, in terms of perceived recoil. In fact, I’d say that it was *much* worse. It’s completely subjective, but it does make sense, for a couple of reasons. First, look at the weight of each gun, compared to the ME of the bullets shot. The J-frame is 13.3 ounces, or about 25% of the 53 ounce weight of the Anaconda. But the ME of 386 ft-lbs of the .38 Special bullet is 38.25% of the ME of the .44 Mag at 1009 ft-lbs. Put another way, the J-frame has to deal with 29 ft-lbs of energy per ounce of the gun, where the Anaconda has just 19 ft-lbs of energy per ounce of the gun. That’s a big difference. Also, all that recoil of the J-frame is concentrated into a much smaller grip, when compared to the relatively large grip of the Anaconda. Simply, it the difference between being smacked with a hammer and a bag of sand, in terms of how it feels to your (or at least, my) hand. 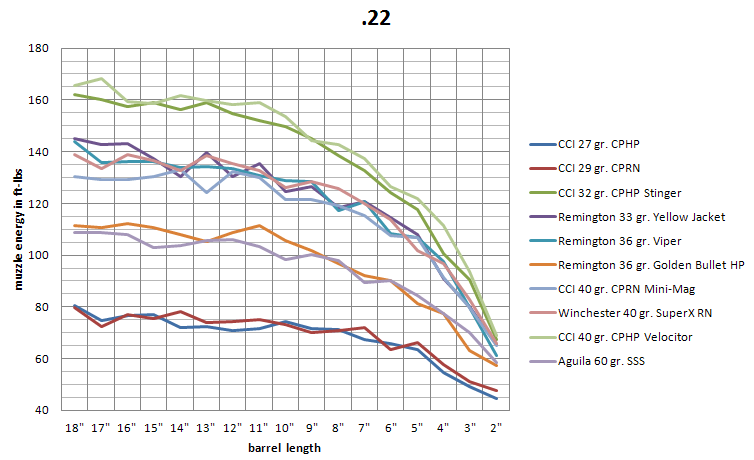 what more is really needed, is barrel lengths between 1-7/8 and 4-1/2″. and snubby revolvers that may be even shorter. otherwise, given the particular ammo. It’s not an unreasonable thought, on the surface. Our data clearly shows that the largest gains in bullet velocity always come in length increases of very short barrels for all cartridges/calibers. So why not document the changes between, say, a 4.48″ barrel and a 4.01″ one? That’s the actual difference between a Glock 17 and a Glock 19, both very popular guns which are in 9mm. Or between a S&W Model 60 with a 2.125″ barrel and a S&W Model 360PD with a 1.875″ barrel? 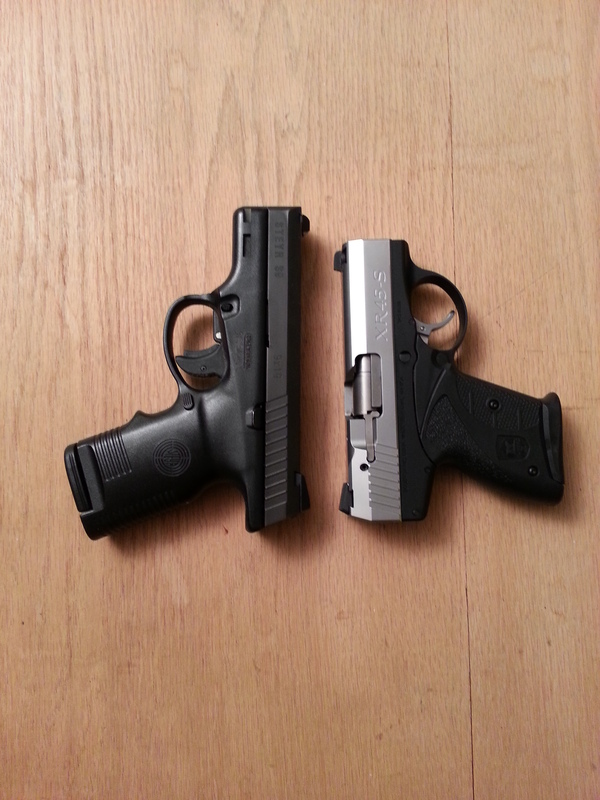 Ideally, it’d be great to know whether that half or quarter inch difference was really worth it, when taking into consideration all the other factors in choosing a personal defense handgun. The problem is that there are just too many different variables which factor into trying to get really reliable information on that scale. Oh, if we wanted to, we could do these kinds of tests, and come up with some precise numbers, and publish those numbers. But it would be the illusion of precision, not actually useful data. That’s because of the limits of what we can accurately measure and trust, as well as the normal variations which occur in the manufacturing process … of the guns tested; of the ammunition used; of the chronograph doing the measurements; even, yes, changes in ambient temperature and barometric pressure. That’s because while modern manufacturing is generally very, very good, nothing is perfect. 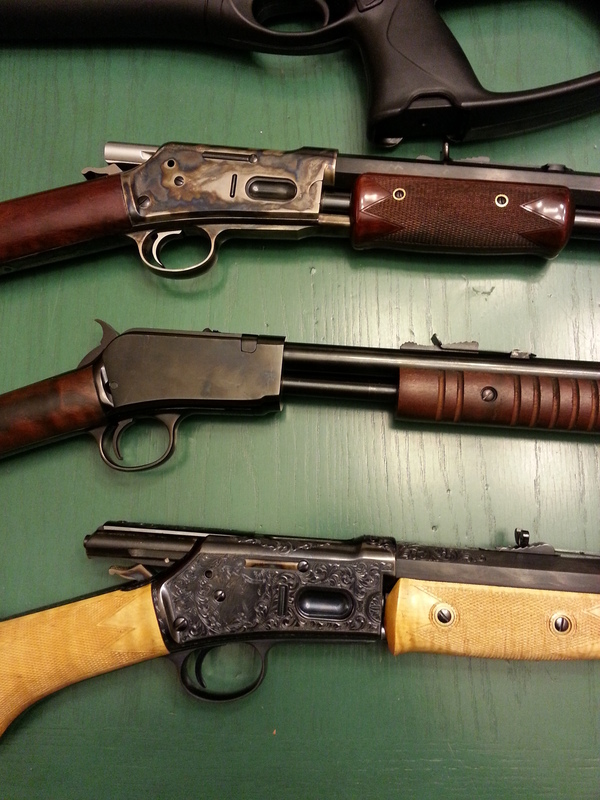 Changes in tolerance in making barrels can lead to variation from one gun to the next. Changes in tolerance in measuring the amount of gunpowder which goes into each cartridge (as well as how tight the crimp is, or even tweaks in making the gunpowder itself) mean that no two batches of ammunition are exactly alike. And variations in making chronographs — from the sensors used, to slight differences in positioning, to glitches in the software which operate them — mean that your chronograph and mine might not agree on even the velocity of a bullet they both measure. All of those little variations add up. Sometimes they will compound a problem in measuring. Sometimes they will cancel one another out. But there’s no way to know which it is. This is why we’ve always said to consider our data as being indicative, not definitive. Use it to get a general idea of where your given choice of firearm will perform in terms of bullet velocity. Take a look at general performance you can expect from a brand or line of ammunition. Compare how this or that particular cartridge/caliber does versus another one you are considering. But keep in mind that there’s no one perfect combination. You’re always going to be trading off a bunch of different factors in choosing a self-defense tool. And never, ever forget that what matters most — FAR AND ABOVE your choice of gun or ammunition — is whether or not you can use your firearm accurately and reliably when you need to. Practice and training matters much more than whether or not you get an extra 25, or 100, or even 500 fps velocity out of whatever bullet is traveling downrange. Because if you can’t reliably hit your target under stress, no amount of muzzle energy is going to do you a damn bit of good. If you want more information about how accuracy and precision can be problematic, this Wikipedia entry is a good place to start. 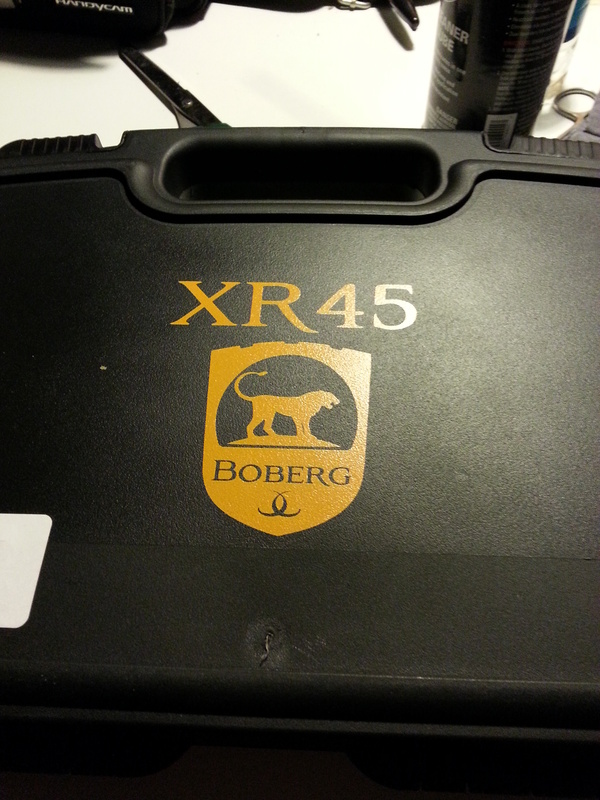 Over the weekend I posted about picking up my new Boberg XR45-S. This afternoon I took it out for a first “getting to know you” session. More about that in a moment. First, I want to share a couple of things I discovered in getting the Boberg out of the box, taken apart, and cleaned. This wasn’t strictly necessary, of course, because it came from the factory properly cleaned and lubed. But I’m very much a hands-on learner, and wanted to see what I was dealing with. Once the slide comes away from the frame, there are only 4 parts which come apart (other than the slide itself). There are no little fiddly bits to get lost or to spring out of sight when you’re not looking. You don’t have to disassemble the gun in a paper bag so that you don’t lose anything. It’s easy, obvious, and once you’ve done it following the owner’s manual, I doubt you’ll ever need to refer to the manual again. You can’t ask for more than that. So, dis-assembly, cleaning, and re-assembly is all a breeze. Nice! Having done so, I went through my box of misc. holsters to see what the Boberg might fit into. 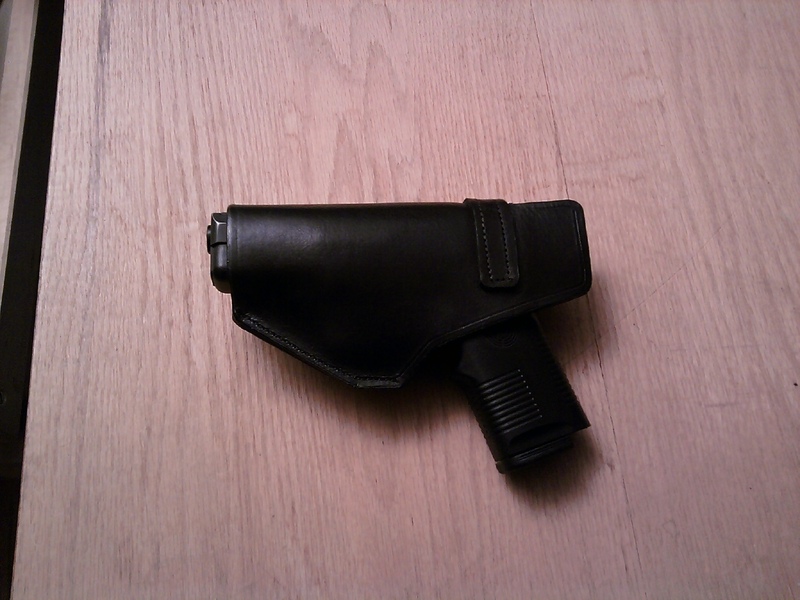 Because the XR45 is so new there are damned few holster-makers out there who have a holster listed to fit it. And I discovered something VERY interesting: the slide has almost the exact same dimensions as the Glock 21 (and similar Glock models). 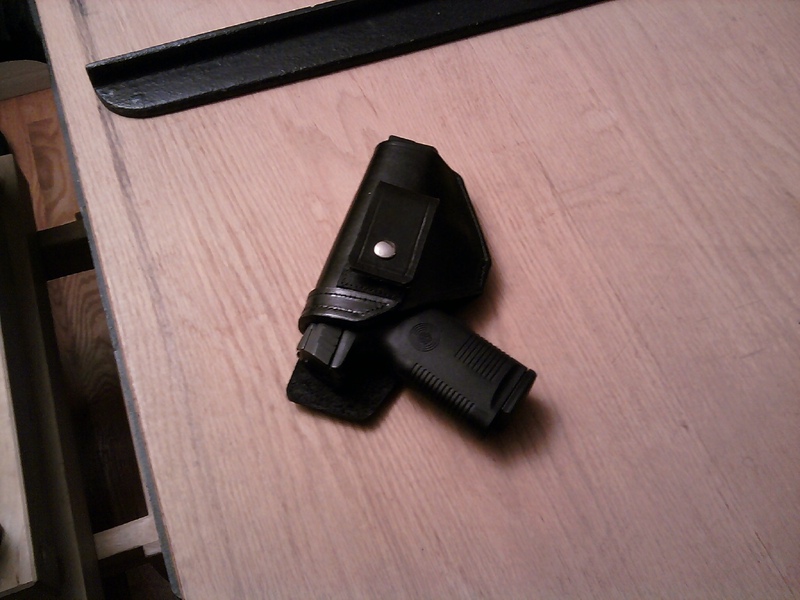 I first found this out in trying it in this little plastic holster: Glock Sport Combat Holster. I got out my calipers and did some measuring, and found that there was less than a millimeter difference in the width of the slide on the Glock 21 and the Boberg. They also have very similar profiles. And if you measure from the deepest pocket on the backstrap of either gun (where the web of your hand settles in) to the front of the trigger guard, there is less than 2 millimeters difference. 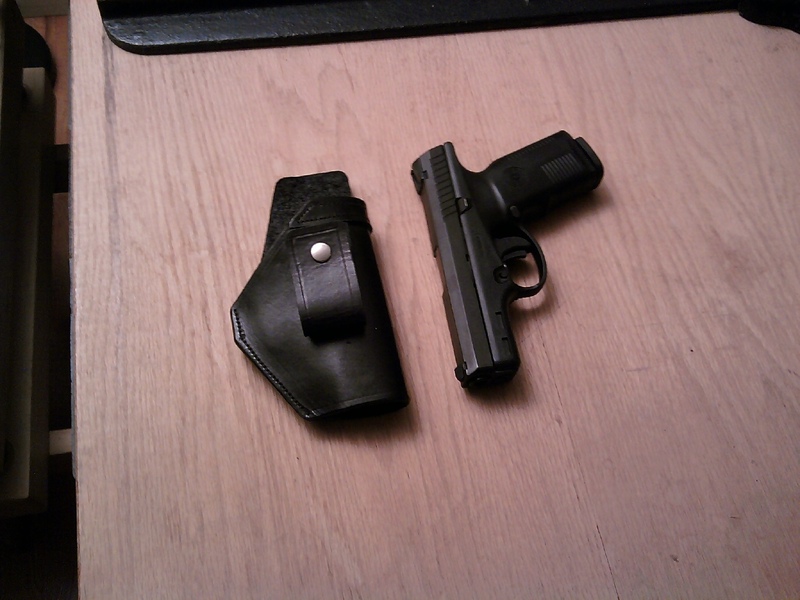 Meaning that the Boberg fits almost perfectly into an open-muzzle holster for a Glock 21. Good to know! 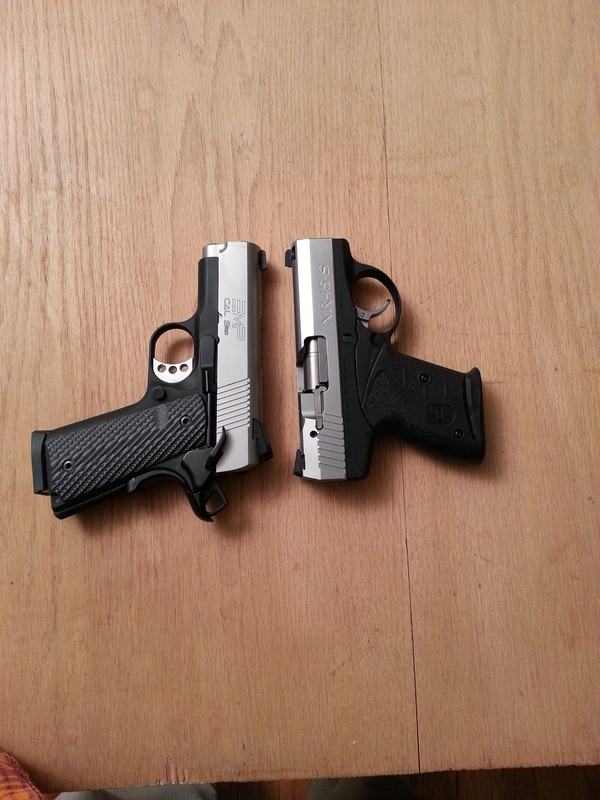 OK, so what about going out shooting with the Boberg today? Overall, I was very happy with how it performed on a first outing. I had a couple of minor glitches with improper feeding and ejection, but I am going to hold off on making any decisions about that until I give it at least another range session to break in. It does seem to fling spent cases somewhere into the next county, and I’m going to have to get used to that since I like to recover those cases and reload them. My very mild reloads wouldn’t cycle properly (the ones I took out are *really* mild), so I learned to take somewhat hotter loads. And the trigger is really l o n g … longer than either J-frame I own, and about like the little DAO Rohrbaugh I have. The gun seems to shoot a little to the left for me, but I won’t adjust the sights until I’m more familiar with it. Even so, I was able to consistently ding a 6″ spinner at 10 yards, which is all I expect from a pocket pistol. How did it handle the different ammos I tried? Quite well, all in all. The CorBon ammo is in line with what we tested formally. So that was good to see. All together, I put about 100 rounds through the Boberg this afternoon, and wasn’t experiencing any real soreness or tiredness from all that shooting, which is unusual for such a small gun and full power loads. And just for comparison, I shot my .38Sp J-frame with 158gr LSWCHP +P from Buffalo Bore, which is my preferred SD loading for that gun, and the recoil was worse than with the Boberg. That’s for a ME comparison of 386 ft/lbs for the J-frame to 436 ft/labs for the Boberg with the 185gr CorBon loading. So, that’s that. Already, the Boberg is equal to the J-frame, in my eyes. I shoot it as well. It has the same, or greater, amount of power. Reloading is faster. And it holds 6+1 to start. I still want to put it through its paces before I trust it as a carry gun, and there will be times when I still prefer to have the revolver, but already I can see that the Boberg is going to be a very nice addition to my collection. This gun is a winner. It is well designed, and well made. The innovative design makes your brain hurt when you first see it. But the recoil is nothing like what you get from any other “pocket gun”, even when shooting full +P defensive ammunition. Usually with a pocket gun, you trade off the pain of shooting it a lot for the convenience of being able to carry it easily. With the Boberg, you don’t have to make that trade-off. I honestly wouldn’t be bothered at all by running a couple hundred rounds through this gun at the range. Well, guess what followed me home today. Yup, one of the new XR45s. Starting in the upper left corner and going clockwise, those are: A Steyr S9 in 9mm, a Springfield EMP in 9mm, the Boberg XR45 in .45ACP, and a S&W J-frame in .38sp. 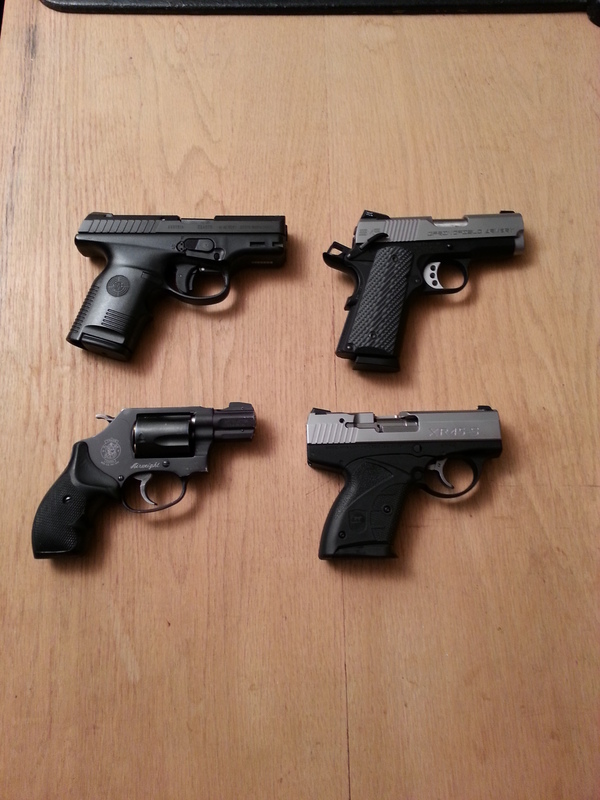 Yeah, the 6+1 Boberg is actually smaller than the three other compact pistols. And it has a longer barrel than all three — 3.75″ on the Boberg, compared to 3.5″ in the Steyr, 3.0″ in the EMP, and 1.875″ on the J-frame. It takes some getting used to, I admit. Now, while the Boberg is actually smaller in overall size than the other guns, it still has some heft to it: 22 ounces, as opposed to both the Steyr and the EMP at 26. The J-frame shown is a Model M&P 360 with the Scandium frame, so it comes in under 14 ounces. All of those are unloaded weight. That was with .45 ACP+P high-end self-defense rounds. Since I just got mine, it will take a while to find out all the little quirks that it has. But based on shooting one a few weeks ago, and in a much longer session with the 9mm version, I have little doubt that I will be very pleased with it. I’ve already poked around my selection of holsters, and found that the XR45 fits perfectly into a little belt slide holster I have for my Glock 21 Gen 4, as well as into a Mika Pocket Holster I use for the J-frame. Perceived recoil and bullet weight. I hope that you folks can help me with a question I have had for many years now. Why is the recoil so much heavier with lighter bullets in the same caliber and powder loadings than heavier bullets of the same caliber and loadings? For example. With my S&W model 60, Gold Dot L/E 38 special 135 grain JHP +P loads recoil much harder than the Remington 125 grain JHP +P loads. The same thing happens with my Glock mod 23 .40cal when I shoot 180 grain JHP rounds vs 165 grain JHP rounds. The 165 grain rounds recoil much harder. One would think the heavier round with the same powder load would recoil harder. Can you help? Perceived recoil is a surprisingly complex problem. It’s not just a matter of total force, but the ‘shape’ of the recoil impulse as well. Then there are the ergonomics of how a particular gun fits a particular person/hand. Add in the mechanical action of how the gun operates (some use part of the recoil energy to cycle the action, some don’t), and various psychological/physiological factors (are you tired? just had an adrenaline dump? afraid of a given gun/caliber/cartridge? ), and you can see how many different factors might come into play. A good place to start is to look at the equation for Muzzle Energy (ME). Let’s use the numbers for the Steyr M40 (very similar to your Glock 23) which was one of the ‘real world’ guns used in the .40 S&W tests we did. Calculations are from Airhog. The 165gr Federal Hydra-Shok JHP has a velocity of 943fps out of the 4″ barrel. That gives a Muzzle Energy of 325.88ft-lbs. The 180gr Federal Hydra-Shok JHP has a velocity of 989fps out of the 4″ barrel. That gives a Muzzle Energy of 391.04ft-lbs. OK, that would seem to indicate that the heavier bullet should cause more recoil. The ME is higher, and you’re shooting them out of the same gun. But I’m a little wary of that example. Usually, a lighter bullet is faster than a heavier one if they have the similar powder charge, out of barrels of the same length. 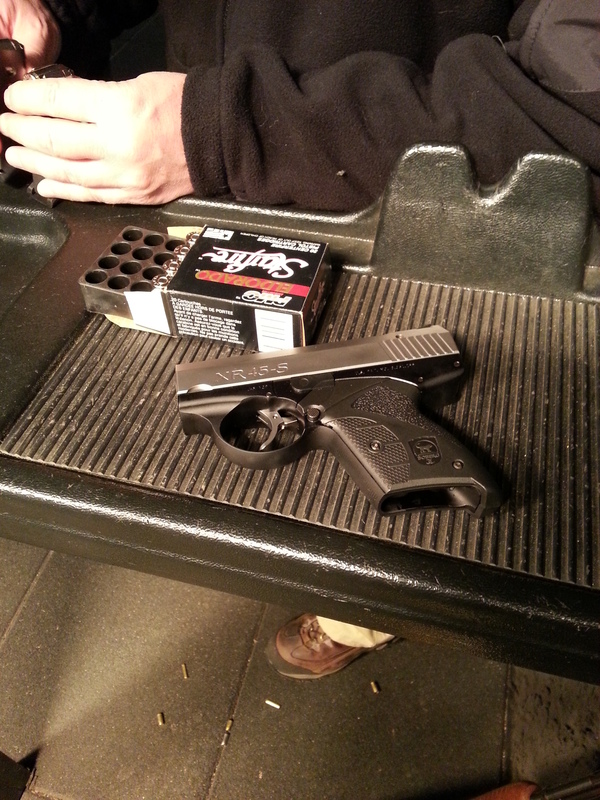 Here’s another example, looking at 9mm from a Beretta 92. The Cor-Bon 90gr JHP +P has a velocity of 1522 out of the 4.875″ barrel. That gives a Muzzle Energy of 463.05ft-lbs. 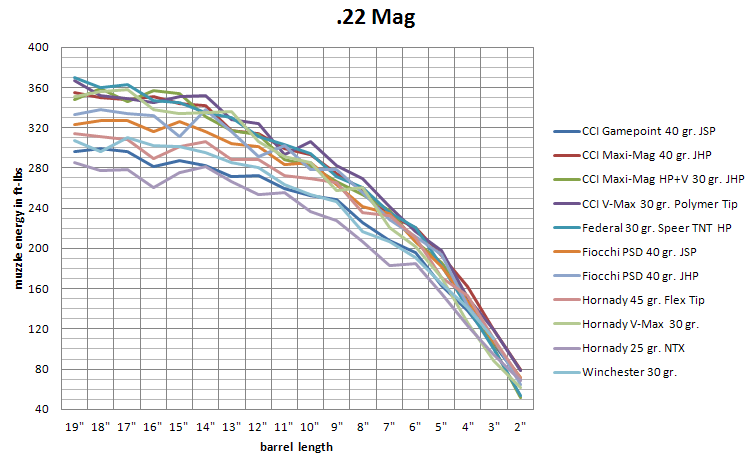 The Cor-Bon 125gr JHP +P has a velocity of 1291 out of the 4.875″ barrel. That gives a Muzzle Energy of 462.72ft-lbs. And those are very close to the same amount of ME, and should feel about the same in terms of recoil were that the only factor. So what’s going on? Why do we see one instance where the ammo is just a bit faster in the heavier bullet (resulting in higher ME), but much slower in another instance? I suspect that it’s probably due to differences in loadings between the different ammo. Even with ammo from the same manufacturer (in the examples above), there’s nothing saying that they are using either the same propellant OR similar amounts of the same propellant for loadings which use different bullet weights. That means that trying to generalize the amount of recoil between different bullet weights just on the basis of brand is difficult if not impossible. The 90gr bullet with 7.0gr of Longshot powder has an overall length of 1.010″ and gives a velocity of 1,378fps, a pressure of 32,300 PSI, and would have a ME of 379.57ft-lbs. The 115gr bullet with 6.0gr of Longshot powder has an overall length of 1.125″ and gives a velocity of 1,203fps, a pressure of 32,300 PSI and would have a ME of 369.64ft-lbs. Note that while the heavier bullet uses a full 1.0gr less of propellant and has a longer overall length, it generates the same amount of pressure. If we drop back to the same amount of the same powder for each loading (6.0gr), then the pressure generated in the lighter bullet loading drops to 29,400 PSI, velocity drops to 1,278fps, and ME drops to 326.48ft-lbs. But not all pressure is created equal, even if it is nominally ‘the same’. The pressure impulse also matters. That’s the curve of how the pressure rises and falls over time, which is largely related to how ‘fast’ or ‘slow’ the propellant burns. Propellants used for handgun loads tend to be very ‘fast’ (burn rapidly), so the impulse tends to be sharper. Here’s a good explanation of the matter. And if you think about it, the heavier the bullet used, the longer/slower it takes to start moving when the cartridge is fired. That should mean that the impulse is spread out over a slightly longer time than it would be with a lighter bullet. So in some sense, the lighter bullet would result with a ‘snappier’ feel. And that may well be what it is that you’re feeling when you experience more perceived recoil (and have controlled for all the other factors) from lighter bullets. Other thoughts on the subject? The cartridges covered are .22 LR, .25 ACP, .32 ACP, .380 ACP, 9mm Makarov (9×18), 9mm Police (Ultra), .38 Special, 9mm Luger (9×19), and .45 ACP. His data and presentation makes a great companion to our own data, and I really recommend that you set aside the time to watch the video at your earliest convenience. 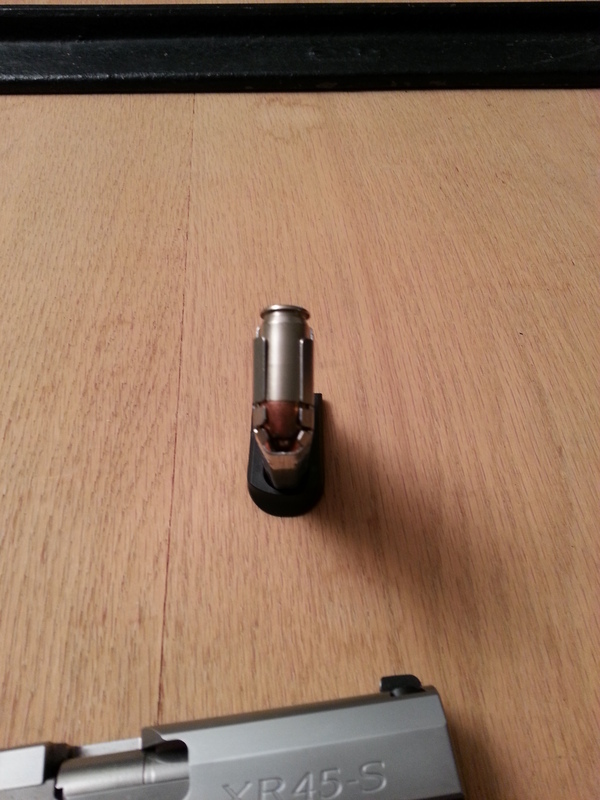 Some weeks back I put up a post about my preliminary experiences with a .460 Rowland conversion for my Glock 21 Gen 4. In it I mentioned how much I like the resultant gun, but also how I was having some problems with magazine wear when shooting full-force .460 loads. See whether the problem was due to the case length of the .460 Rowland cartridges (they’re 1/16″ longer than .45 ACP). See whether the problem was due to the *power* of the cartridges rather than the length of the cases. To test the first, it was a simple matter to get a more powerful mag spring and test it in one of the magazines. I picked up a Wolff magazine spring from Midway and did so. To test whether it was the simple case length of the .460 Rowland cases, I made up some .460 Rowland rounds using .45 ACP reloading standards. To test whether it was the *power* of the .460 loads but not the case length was another matter. Here’s where we get to the Don’t Try This At Home part of today’s blog post: I made up a number of .45 ACP rounds which were loaded to .460 Rowland specs. Let me repeat that again: Don’t Try This At Home. These are wildcat rounds, and potentially dangerous. Shooting them in a gun not rated for .460 Rowland stresses could very well result in catastrophic failure of your gun, of the “KABOOM!” variety. Even shooting them in a gun designed to handle .460 Rowland power was risky, since the .45 ACP cases do not have the same strength as the .460 Rowland cases. I made up just 10 rounds of each of these loadings, and was careful to make sure I shot them all, so that they didn’t accidentally wind up in a .45 not strong enough to take the punishment. No, I’m not going to give the specific powder amounts for any of those. I used Hodgdon Longshot powder, and you can look up the specs if you want to know more. OK, a couple of comments before I go further: those are “approximate” chrono readings because I wasn’t being anywhere near as careful as we are when we do formal BBTI testing. To wit: I was just using one chrono; I wasn’t worried about getting the exact same number of readings (so long as I got three or four, I wasn’t too worried about it); and I didn’t do anything to control for consistent lighting or suchlike. But they should all be in the right ballpark. So, looking over all those, you will see what I see: that there was a remarkable consistency in power levels, whether you’re looking at my reloads or factory loads, and between those rounds which used either .45 ACP cases or .460 Rowland cases. That tells me that following the published data for .460 Rowland reloads, and making some intelligent decisions on how to adapt those to the .45 ACP cases for purposes of this experiment, was by and large successful. Meaning that I can use those loads to fairly evaluate what makes a difference on the basic problem I was investigating: what is causing the magazine damage and how to resolve it. So, what conclusions did I draw from all this? First, the more powerful magazine spring seemed to help with consistent loading. I will be swapping out all the Glock 21 mag springs I have. This makes intuitive sense, since the slide is moving faster when shooting the more powerful rounds. Note that these are just the magazine ‘boxes’ — the guts (spring, follower, etc) have all been removed for clarity. With the altered magazine and stronger spring, any problems I had with Failure To Feed was minimized. And most important, it is the *power* of the round, not the case length, which seems to cause damage to the unaltered magazines. Shooting the .460 Rowland power loads in the .45 ACP cases demonstrated this. 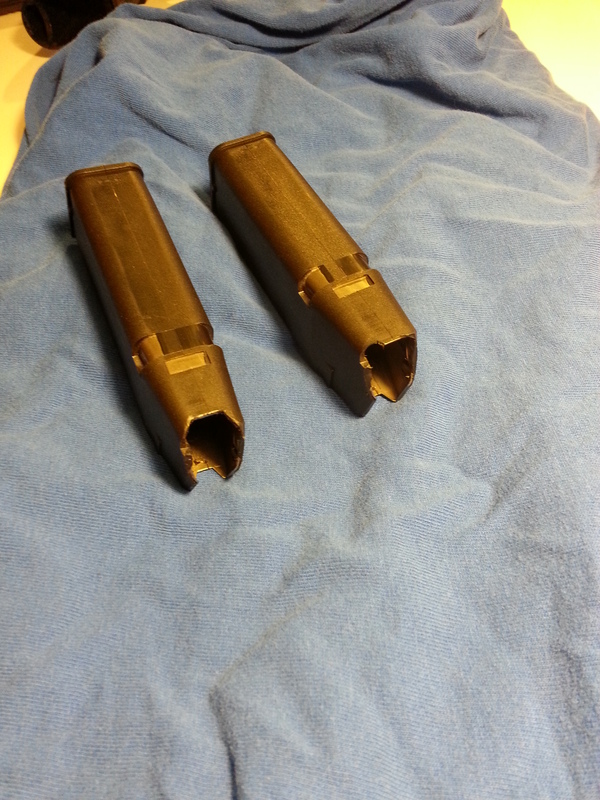 Conversely, shooting the .45 ACP power loads in the .460 Rowland cases didn’t cause any magazine damage at all. Two additional notes I want to add: the first is that I had pretty consistent problems with the heavy Lead Flat Nose rounds in all configurations. They kept getting jammed up in transitioning from the magazine into the chamber. I’ll probably continue to experiment with this in the future, but I’m not too worried about it, since many guns run into some ammo specific problems. The second is that once again I was really impressed at just how well this reconfigured Glock 21 did with .45 ACP loads. Seriously, with the .460 Rowland conversion in place, there was very minimal recoil (more than a .22, but not much) and it was VERY easy to control and shoot the gun well. I suspect that going forward the vast majority of the shooting I will do with this will be using standard .45 ACP reloads, saving the much more powerful .460 Rowland rounds for occasional practice. In this sense, I am thinking of the .45/.460 relationship the way I think about .38/.357 — it seems to be a perfectly appropriate analogy. Now that I have all this sorted, I can go ahead and write up a formal review. But I thought I would share a little of the process of how I got to this point. Smaller semi-automatics and derringers do fit, but sit so far down inside the holster that they are difficult to retrieve. So, here’s the deal: make any kind of contribution to the Kickstarter (as little as $1.00 – I won’t mind), and enter into a drawing for a holster. Please note that this is *IN ADDITION* to the other rewards there on the Kickstarter – all perfectly good and valuable rewards. Then just come here and leave a comment, or post it on the BBTI Facebook page, or send me a Tweet. I’ll enter your name into a completely separate drawing. And each week or so while the Kickstarter is going I’ll select a name and send that person whichever holster is up for grabs. Each winner’s name will go back into the hat for the next drawing, so you have multiple chances to win (meaning that the sooner you enter, the better for you). If you’ve already contributed to the Kickstarter, just let me know and your name will go in the hat for the first drawing (and subsequent ones). I will draw a winner next Friday, Oct 12. And here’s a heads-up: the final drawing will occur on Wednesday, Oct. 17, — the day after the Kickstarter ends. And that item will be a High Noon Skin Tite holster. Remember – you just need to “enter” once, and you will automatically be added to both drawings. So, what are you waiting for? Go register!